The office has seen many different looks in the last few years. We used to have big shelves up at the back of the room, but I stopped liking them. They just felt like dust collectors and I felt such a pressure to feel them with stuff. And really, I just wanted to get rid of the stuff. Also, the piano got moved out when my husband started working from home last year and my girls needed to practice after school while he was still working. But even after so much change in the office, it still looks a lot like it did. 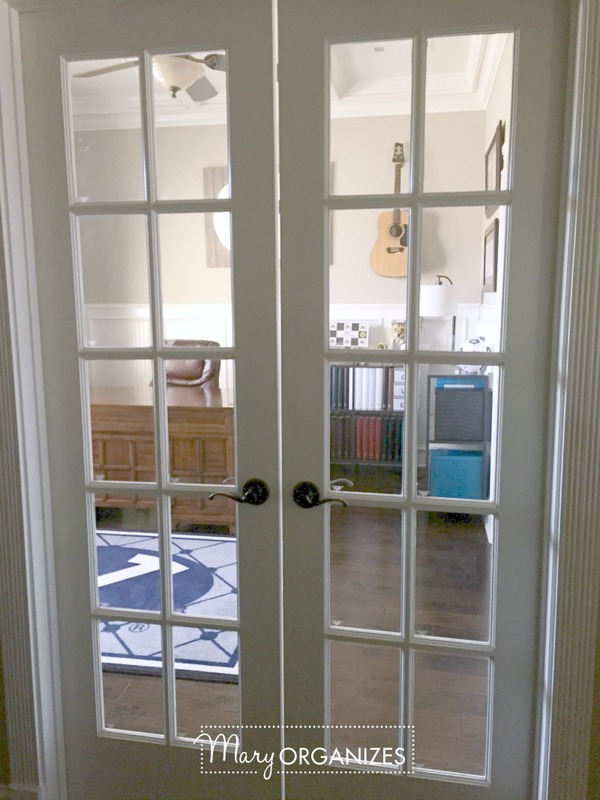 There are two entrances into the office, these french doors allow partial privacy. So privacy from sound, but you can still see in or out. Welcome to our office! 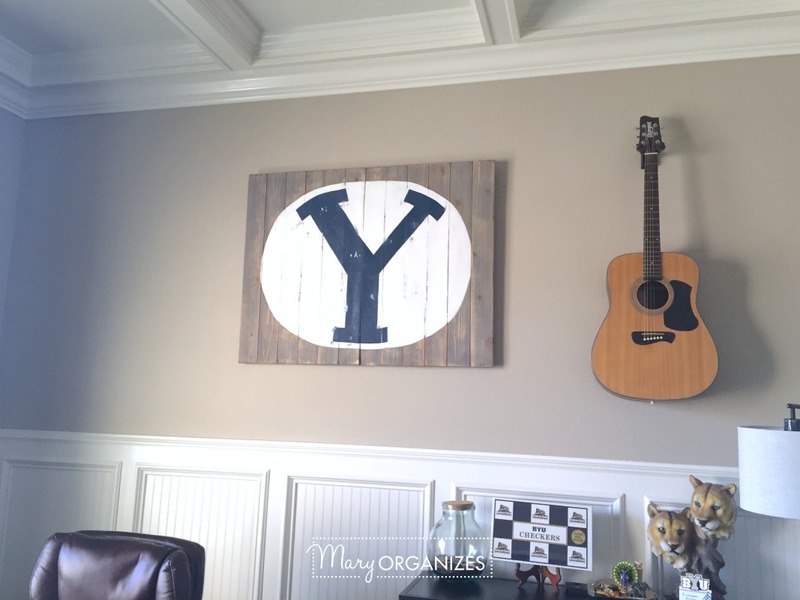 You probably can’t tell from the pictures, but my husband is a pretty big BYU fan. 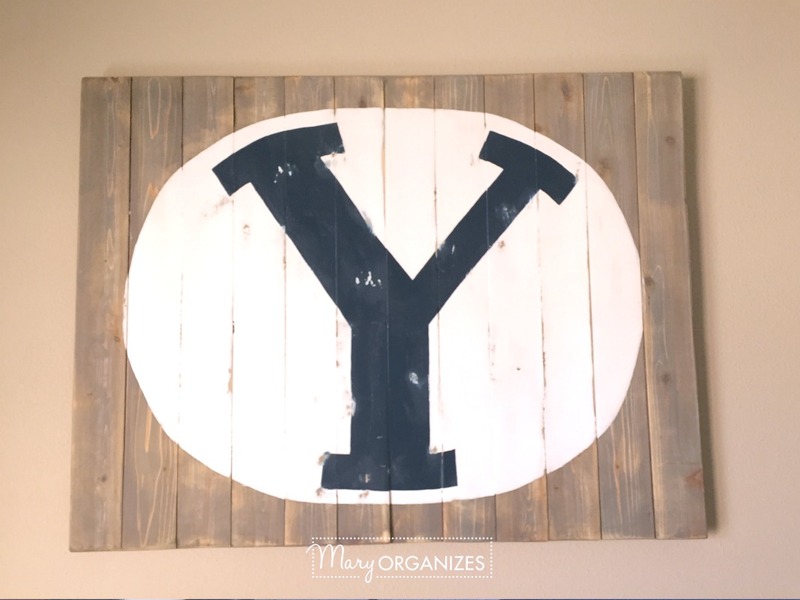 I know what I want to put on the left side of the”Y”, but it is a project I’ll finish after winter, when I can use my garage as a workspace. Some decor touches last longer than others. These navy burlap curtains still make me happy and fit this room, years later. They are pulled back now with hardware instead of fabric. 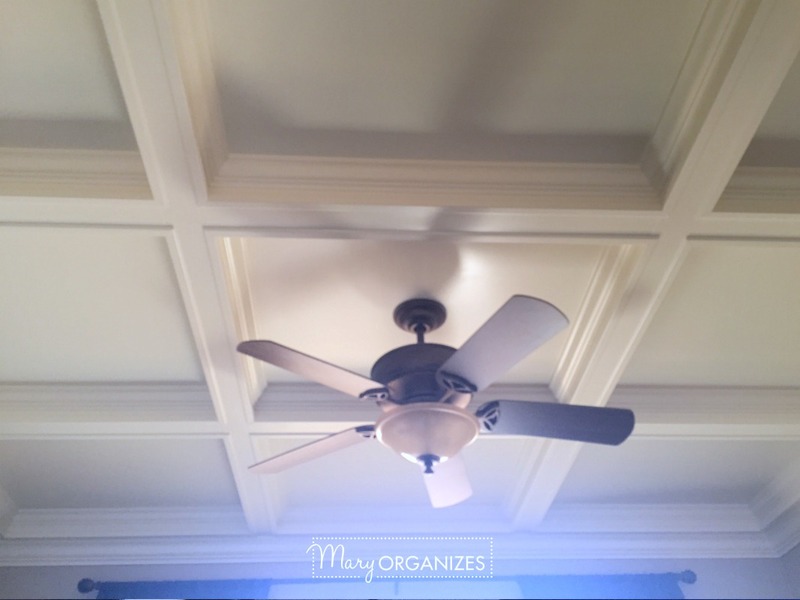 The ceiling – still love the detail! The chair is a new addition because when my husband is in here so much, people often want to come in and sit with him for a little bit here and there. It makes a great reading chair. This is also the favorite downstairs place of our little man, Cougar. He loves playing with the Millennium Falcon. Admittedly it was hard for my husband to let my three year old son actually play with it because this particular Legos thingy is quite expensive and traditionally Star Wars fans just put these things together and then don’t ever touch it again, but I lovingly wore him down – “look how happy it makes him”. Just my opinion, but toys were meant to be played with and we have a home, not a museum. He is a really good dad!! 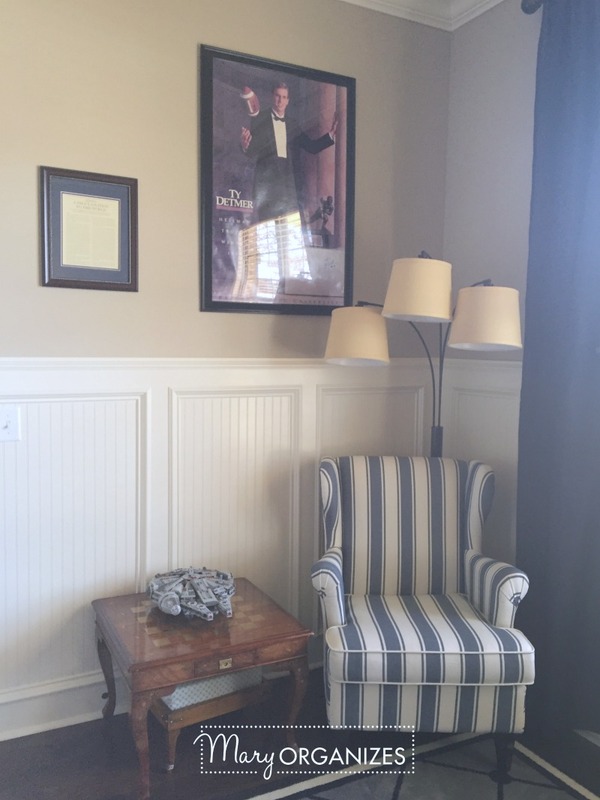 From my husband’s desk, you can see a view of my little desk nook next to the kitchen. This is where I pay bills, go through my kids school papers, and take care of all the home stuff. I used to do all of my blogging and business stuff from there too, but now I have a full-time office upstairs for my work. These are now the shelves in the room. Quite a downsize from the huge shelves that were here before! Mostly they hold our photo albums and memory boxes. The tops of the shelves are a little more cluttered than I love, but I need to finish my project for the wall so I can get some of it off of the shelf tops. This “Y” was Matt’s birthday present last year. It was a winner! I love it as a centerpiece for the room. I created it using cedar wood screwed together with wood going the opposite way in the back and then I painted it and distressed it. 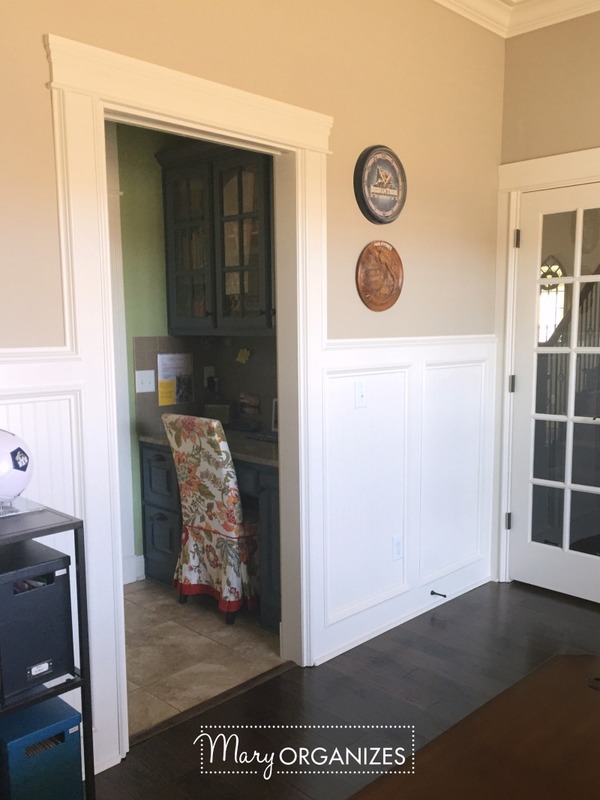 I still love the desk, which was the first piece of furniture I selected for this home before we moved in. I loved the way the “windows” on the back would mirror the “windows” on the ceiling. 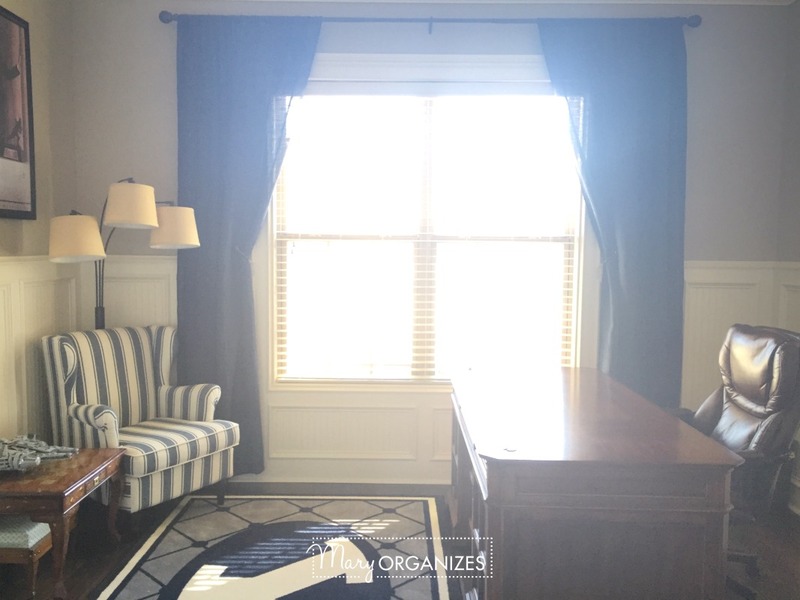 The other day when Matt and I decluttered the office together, I sat in the chair while he sat at his desk and I told him I was going to treat him like a real client and talk to him about the maintenance plan for his office. It was kind of hilarious, because I’ve never had a client tell me that he preferred to procrastinate, so if I could help him develop a system to perfect that. We brainstormed “great ideas” and ironically you can find many of them on Pinterest under the guise of helping you get organized. Ha!! I’m telling you – my toughest clients live right here!! I hope you’ve enjoyed a little peek into the office. 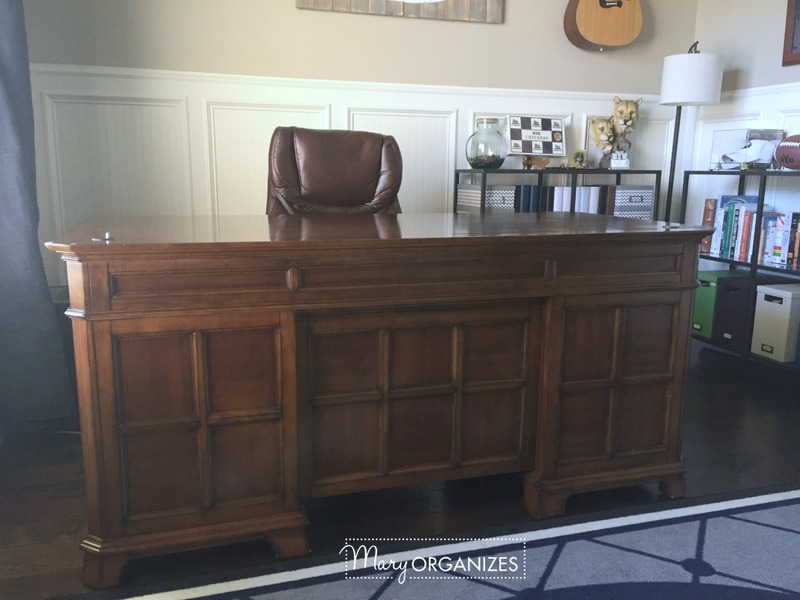 Really dig in to decluttering your office this week! 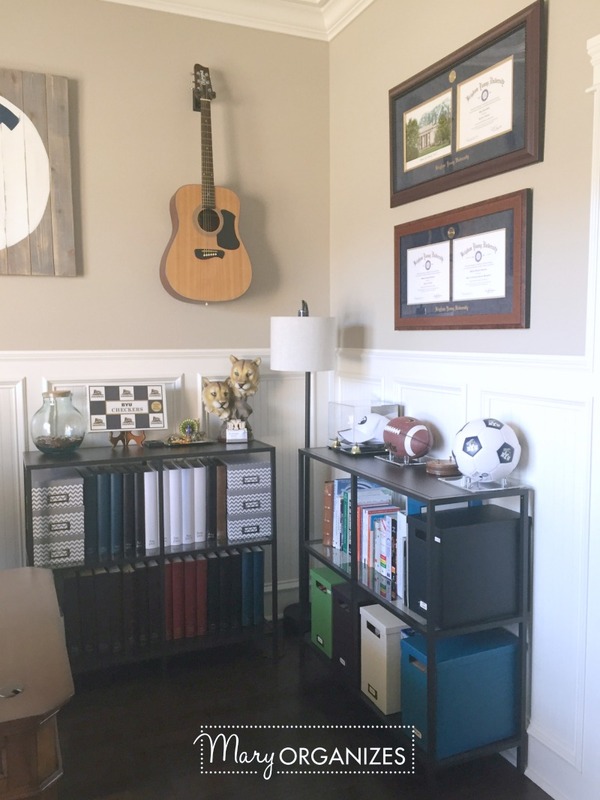 A decluttered office is sooo worth it! Subscribe to the blog emails, Like Mary ORGANIZES on Facebook, and Join the Facebook Group. Everything looks beautiful! I love the guitar hung on the wall! And the fabric on your desk chair is stunning! Thank you, Daria! The fabric was a chair cover from Pier 1 five years ago. I’m so nervous for it to wear out because I LOVE it too. 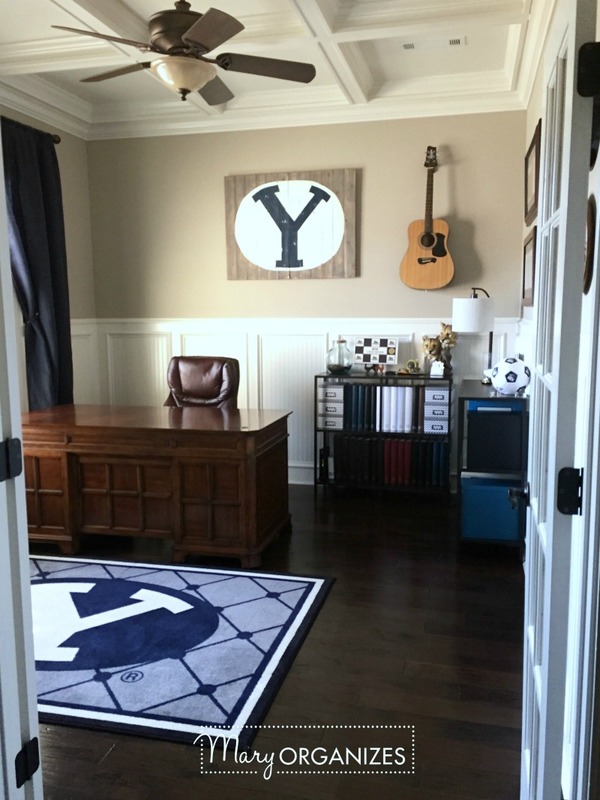 I love those French doors and the office looks great. Thanks for the inspiration, this is going to be a hard room for me to work on it I am determined to do it! Yes!! Let the determination see you through!! If you ever need anything from the “Y” let me know. I’m minutes away and happy to send. What a fun office for your hubby but not to guyish. Love it. I’m trying to work through ours but we will probably have a “scout” theme since that is our life right now. I’m glad you can close the door, because I’m sure that helps you focus on what you can do. We’ve all got clutter, just in different forms, and we are all on different journeys to clear the junk. Very nice, I love your bead board and ceiling!